Prodding from a library colleague led Pam DeFanti Robinson on an adventure that’s put her at the heart of influencing young lives — just in a different classroom than originally planned. Robinson currently serves as the director of the University of South Carolina School of Law pro bono program. Before law school, Robinson’s path was elementary education. The Rhode Island native came to South Carolina as a teen during her father’s relocation with DuPont. With no ties to Clemson, she applied because a summer program had piqued her interest. After teaching in Atlanta and outside Washington, D.C., life brought her back to South Carolina, where she settled in Camden as a children’s librarian. “I knew I needed to go back and get another degree,” said Robinson. A colleague challenged her to try law school. Robinson stayed around USC’s law school after graduation to assist with projects. A conversation over a cup of coffee with her dean was how the pro bono program idea started — the first of its kind in the state and the nation. Now she’s opening doors for those who need legal aid and students who need guidance navigating careers. The program is open to all law students who are willing to volunteer to work on everything from filing taxes to translating documents to Spanish. Robinson says every class is different and offers a different skill set and potential for what they can accomplish that year, but the one-on-one experience the program offers showcases the breadth of the law and what a potential practice can entail. And even though her students are bigger than first-graders, she still gets tickled when her students have “eureka” moments. “That’s such a good feeling to say, ‘Hang in there, you can do that,’” she said. “We can’t, as law school and law students, solve all the problems of the community, but we can be there as part of the solution,” she said. Fabio Tambosi spent his childhood with a soccer ball rolling at his feet. Soccer came naturally to him, and he moved from playing in the streets of Brazil to playing in the youth academy of a professional club in São Paulo. These days, Tambosi isn’t bumming cleats off the most famous players in the world — he’s partnering with world-class athletes to sell them. As the director of global football brand marketing at Nike, Tambosi is a leading voice for an iconic brand. Tambosi hasn’t left that family behind, despite his success. He stays involved as a board member at the Erwin Center for Brand Communications, where he helps students develop advertising and marketing skills. “There’s nothing better than being recognized by my alma mater and going back and giving back what Clemson has given to me,” Tambosi said. Tambosi wants students to understand that it isn’t possible to fulfill one’s dreams without risking failure. He knows this to be true because he has risked it all. In 2012 he was working a stable, well-paying job in London for Nokia. But, Tambosi wasn’t satisfied — he had other ideas. “I wanted to go back to sports, and I wanted to have a role in the World Cup in Brazil. And I wanted to work for Nike,” Tambosi said. While looking for internships at Clemson, Seldric Blocker was plucked for a program with First Union. But not for banking or financial needs; it was human resources. Now he’s the director of campus recruiting, shaping paths for future generations of network newsies and entertainment execs as the director of NBCUniversal’s talent acquisition campus programs, Campus2Career. Each year he fields more than 42,000 applications for about 2,000 spring, summer and fall internships. In the last three years he’s managed more than 5,500 interns, including 300 added to cover the 2016 Summer Olympics in Rio, Brazil. Blocker is also focused on building diversity across NBCUniversal’s platforms. “We are looking for people who have demonstrated their leadership on campus. We employ a wide variety of majors and backgrounds. They don’t just have to have a passion for media and the entertainment industry. We want to know what you can take from your background and bring to the table to help us tell a more well-rounded story,” said Blocker. Student safety first. It’s a call answered by Clemson Fire and EMS every day, but it was a group of students who first wanted safety ensured. In the late 1970s Johannes Huber was part of the core group that formed an EMS club on campus. Through training from the Pickens County EMS, Huber and his friends aided students with everything from helping when a Homecoming float turned over and injured a dozen people to providing aid to heart attack victims. “We were really taken in by the student body,” said Huber. Within a year, they were already seeking funds for an ambulance to have proper transportation for runs. Within Huber’s three years at Clemson, his team was completing up to 150 runs a year, with the backup of Clemson’s fire department. Huber’s interest in medicine and helping people goes back to his childhood in Germany, when he would bandage local bikers. “Medicine was always my gift,” he said. Grades though, not so much. A letter from a pen pal from Pennsylvania mentioned Clemson University. Knowing he needed to improve his grades to get into medical school, Huber thought studying abroad would be good for him. So to the hills of South Carolina he went. “It’s just this beautiful town in the countryside with rolling hills and open to an orange and white heaven,” he said with a laugh. Twice a week he wrote home. Once a month he’d call so his family could hear his voice at $10 a minute. But as an older biochemistry student at age 21, he was looking for more than football games and fraternities to fill his time. “Implementing something new gives you so much energy,” said Huber.“I couldn’t go home on weekends, so I stayed and learned [medicine] through experience.” Huber finally did get into medical school in Germany and returned home for training in general, plastic and microscopy surgery. Now he oversees a staff of about 25 nurses and clocks more than 70 hours a week. “Bavarian inspired, Southern made” is their catchphrase. Making sure you eat at their restaurant in Charleston is their game. Clemson is their shared love. 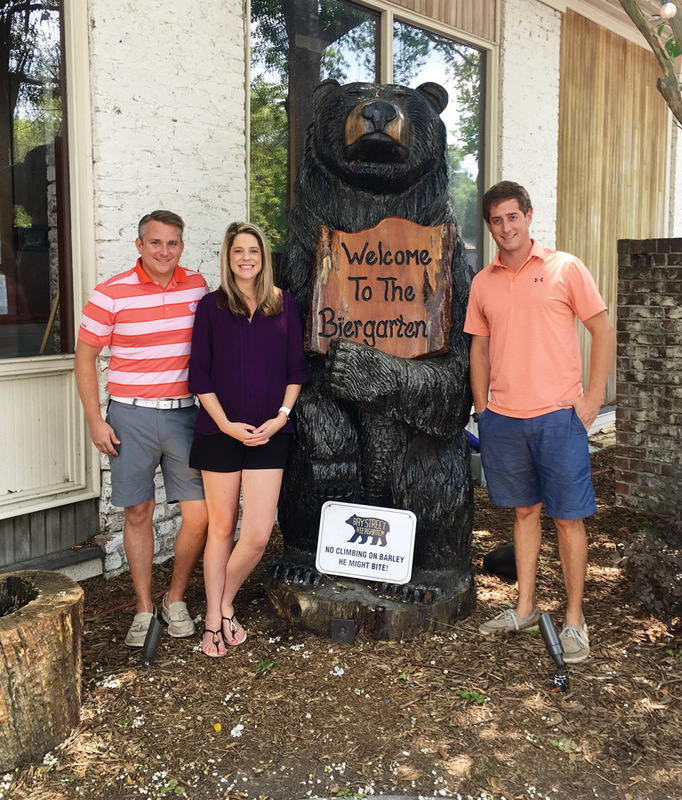 Ryan Workman, Emily Barber Workman and Greg Pierdon are all Clemson grads, but it was a game of kickball and acquaintances in Charleston five years ago that brought them together post graduation. Along with business partner Laura Patrick, the three took a conversation about what was missing in their home of Charleston into a reality that is Bay Street Biergarten. “We saw something different,” said Ryan. It took the group meeting every week for a year to chase their dream. You won’t find kitsch at Bay Street Biergarten though. No lederhosen for sure, but pretzels and schnitzel are abundant. But you’ll also find gator and shrimp and grits on the menu. The 7,400-squarefoot facility is the renovated Wilmington Railroad Depot, offering large exposed beams and original brick, as well as family-style seating for large groups waiting to take in the latest Tigertown brawl. Lessons learned at Clemson, from Greg’s accounting degree to Ryan and Emily’s work in communications and management also come into play every day to keep the business running. Emily said her psychology major is constantly at work as she manages staff and expectations for different personalities. “It’s a people business, and you have to be willing to get yourself out there,” said Emily about management. The three said their team meetings and team spirit, much like they learned through the Greek system while at Clemson, keep them in check when days get long. With the Capitol building as a backdrop, Brittany Avin and hundreds of volunteers placed 20,000 lights in paper bags — each representing a loved one who has battled cancer — and arranged them to spell out two words: “HOPE” and “CURE.” The most important words, though, were the handwritten messages of compassion and support that decorated each bag. 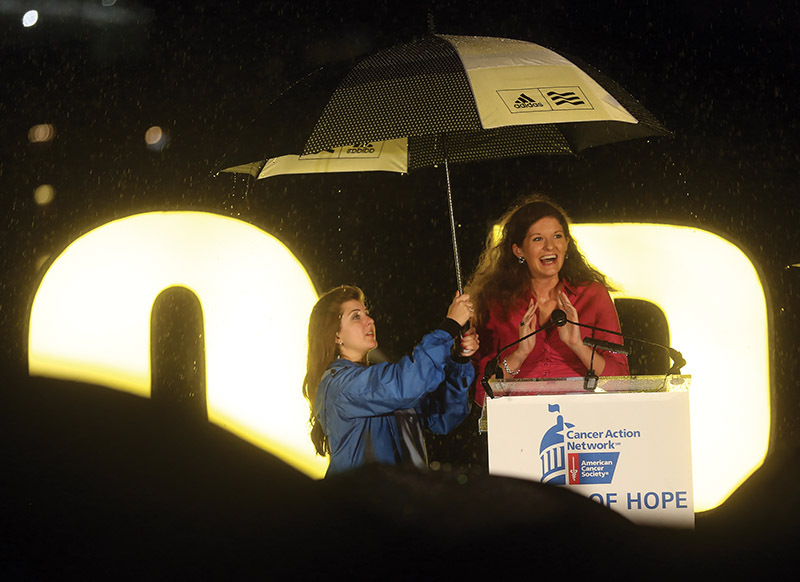 This breathtaking display is a staple of the annual “Lights of Hope” ceremony held in Washington D.C. As the event’s emcee, Avin gave voice to the 750 cancer patients, survivors and volunteers from across the country who attended the event. In addition to honoring those whose lives have been affected by cancer, the ceremony urges Congress to take specific steps to make cancer treatment and research a national priority. Avin’s determination to make a difference began at Clemson, where she took on an ambitious genetics and biochemistry major. Her impressive academic accomplishments earned her an invitation to the prestigious National Scholars Program, and when she wasn’t studying, she spent her summers participating in undergraduate cancer research programs at Emory University and Vanderbilt University. Avin was chosen to lead the national event based on her involvement with Clemson’s “Relay for Life” event as a student and her continued commitment to the American Cancer Society Cancer Action Network (ACS CAN) as an alumna. At the ceremony, Avin spoke from her heart, but also from her experience. She was diagnosed with cancer at age 13. Avin is going beyond advocating for legislative reform as one of 14.5 million cancer survivors living in the United States today. She is currently studying at Johns Hopkins University with hopes to become a cancer researcher. “Research helped make a difference for me when I was 13 years old,” she said. “It is critical that our lawmakers do everything possible to ensure progress toward treatments is not impeded for those who are receiving a cancer diagnosis today or in the future. Sixty years ago, the Clemson family grew by one, one who quickly became one of the most recognizable, lovable and iconic members of the family: the Tiger mascot. He’s been to every football game since his welcome to the Clemson family, done thousands of push-ups, visited hospitals and even danced at weddings. But only the select few actually have had the honor of bringing life to the Tiger. With around 350 appearances each year, committing to being the “man in the suit” is no small feat. These men must travel frequently and train extensively, spending hours brainstorming and executing creative and entertaining stunts, mastering the mascot’s mannerisms and practicing hundreds of push-ups in preparation for sporting events all while still balancing a full student workload. Michael Bays ’97, M ’99, Tiger mascot from 1994 through 1997 and record holder for most push-ups in his career, organized a reunion of former Tigers during Homecoming to share stories and memories of their glory days behind the mask as a celebration of the Tiger’s 60th birthday. An impressive total of 35 alumni and former Tiger mascots gathered together to tailgate, reunite at Death Valley and honor the birthday of their beloved mascot. Among others, this group included several Tiger legends such as Zach Mills ’80, inventor of the push-up tradition, push-up record-setters like Bays, and the oldest living Tigers, Billy McCown ’60 and *Steve “Frog” Morrison ’63.